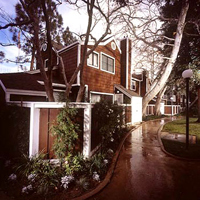 Redwood Village is a 50-unit, project-based Section 8 apartment community located in Marina del Rey, CA. The waiting list is currently closed. The property offers single and one bedroom apartments for people 62 and over, and two, three and four bedroom apartments with no age restrictions. All units include a gas range, refrigerator, waste disposal, ceiling fans and patios. Redwood Village is conveniently located near retail and grocery stores, health facilities, restaurants, public transportation, parks, the famous Venice canals, Venice Pier and the beach. This beautifully landscaped property features magnificent Redwood trees, flowers and a picnic area. Other property amenities include: laundry facilities, on-site management and maintenance staff, a basketball court, community room with WiFi and cable TV, controlled access entry, a gated parking lot, and a childrens day care center. Resident activities include art classes, yoga, zumba, potlucks, annual holiday parties and monthly birthday parties.